Our family recently returned from a trip to Disney World. While not my #1 vacation choice, overall, a good time was had by all (even me). Very different than the mountains of Colorado but still enjoyable. Fortunately, we had the stifling heat to remind us of the stifling heat of our home state of Texas so being home sick was not a problem. My family and I pride ourselves on the ability to have a good time regardless of where we are or what we are doing. This is probably a survival mechanism to (i) prevent us from killing each other and (ii) prevent us from killing others. One of the HIGHLY entertaining ways we extract enjoyment out of a situation like this is to "people watch". We usually come up with a loose game of "bingo" or a weighted points system to make this more challenging. Categories are intentionally kept fluid so the players have maximum flexibility. Actually, coming up with the categories and the ensuing arguments about what would be more challenging to find, is half the fun. Categories might include "Most Inappropriate Tattoo", "Most Unlikely Couple to Actually have Bred and Made a Baby", or "Man or Woman? : You Decide". The general idea is to capture, on a phone's camera, people and situations which will supplement the fun and laugh factors of the trip. The trick is to not get caught while doing this. A stealthy approach is needed and you often have to take the crowd and available cover into consideration. So now, instead of just walking to a ride or attraction and fighting a wall of sticky humanity in the process, you have an additional activity which, I never really thought about, is just like hunting. Spot and Stalk at its finest. There are two direct consequences of these people watching games. First, our vacation pictures include the usual types of pictures of the fam doing usual vacation stuff intermixed with pictures of fat, loud vacationers from New Jersey with unibrows with an abundance of inappropriate tattoos, eating a turkey leg, YELLING at their family members to "HURRY UP MA!!!" or a bored 5 year old in stroller, well beyond "pacifier age" with a finger two knuckles deep in his nose. Second, since you are always on the look out for something of interest, you tend to make many keen observations about your fellow humans. - I'm truly amazed at the variability of the human form. 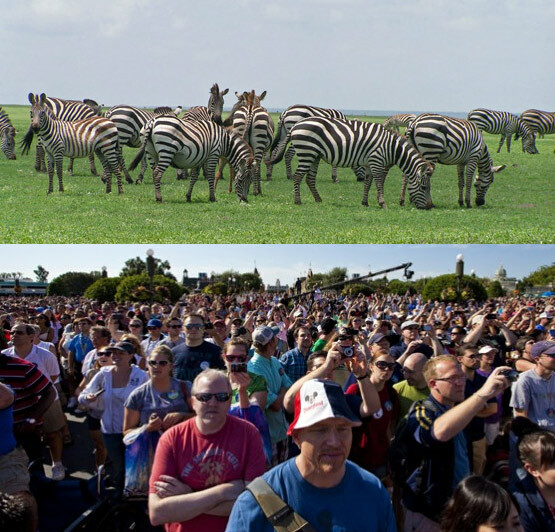 You look at a herd of zebras, you see stark uniformity. Sure, their stripes vary a bit but I bet the adult zebras in a herd only vary by 5% in size and shape. You get fat, or are slow or identify yourself by unique tattoos or leave a scent of turkey legs as you prance around the savanna, a pride of lions or hyenas will GLADLY take you out of the herd. Unfortunately, with too few apex predators feeding on humans in Orlando, you are as likely to see a short, morbidly obese cross-dressing turkey leg eater as you are a group of Chinese tourist with their noses simultaneously buried in a camera and a map who do not appreciate that Americans do, in fact, have a comfort zone. 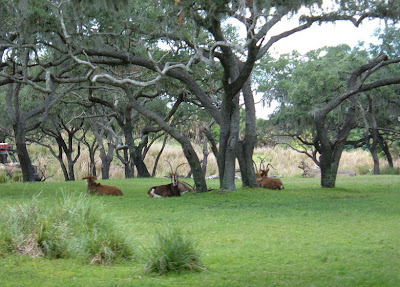 - Disney's Monorail system is an excellent platform from which to observe wildlife. Deer, along with a gigantic snake, were seen as we were shuttled between parks. 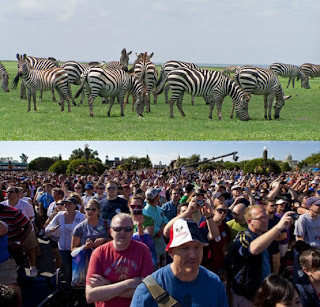 - When riding the Kilimanjaro Safaris "safari" ride an the Animal Kingdom, the people in front of you might recoil in disgust if you casually mention to your daughter "See that one in the middle, he's the shooter!". - Walking is an excellent way to work on your legs for a Colorado hunt. - I would be a millionaire if I had thought to invest in a tattoo ink manufacturer. I'd estimate that 78.3% of ALL people now have ink somewhere on their persons. I could see getting a tattoo IF I was part of an elite group of people like the Navy Seals or drove for Maserati's racing team but to get all inked up to join the legions of folks with just another arm with just another random tribal pattern,... or barbed wire,... or a tramp-stamp expressing how she is "Daddy's Little Girl"?, ... I don't get it. - People have NO ability to think more than 7 minutes into the future. 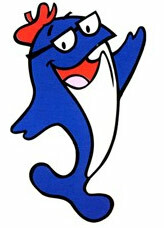 We saw a person with a Charlie the Tuna tattoo. While I'm sure this seemed like a superb idea at 11:17PM one night when you had about 6 too many but it doesn't seem so cool now at 35 with two kids in tow, does it? - I'm not sure if the morbidly obese do not SEE it (and the shocking health and aesthetic consequences) or do not CARE. Every time I saw a person with my frame (5'6") carrying an extra couple of hundred pounds around while they waddled up to a turkey leg counter with the remnants of the last funnel cake they destroyed on their face and shirt, I was mesmerized... "Are they really going to eat more?" "How do you afford this?" "When you stroke out, can I have your FastPass?" Disney has been forced to take steps to make their parks more fat-friendly and have modified many rides to accommodate our more portly fellow travellers. Tired of boats in the horrific "It's a Small World" ride literally dragging bottom and getting stuck, they had to make changes. Can you image the awkwardness as a Disney employee has to subtly ask some of the offending, weighty passengers to disembark so the boat can float again and the other passengers can continue the ride? 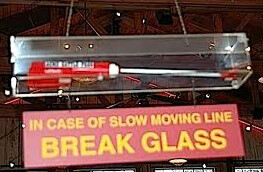 Man, I'd LOVE that job assuming the use of a cattle prod was involved.